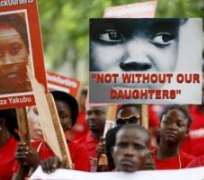 The Bring Back Our Girls, BBOG, group, on Tuesday marched to the Aso Villa, lending a voice to the continuous clamor for the release of the abducted Chibok girls. According to a DAILY POST report, the group, led by Oby Ezekwesili, former Minister of Education and leader of the BBOG, were denied access 'as usual' by a battalion of policemen at the entrance. Security operatives barricaded the entrance, stopping the group from gaining access into Aso Rock. They consequently resorted to sitting on the floor under the scorching sun with their lips sealed.